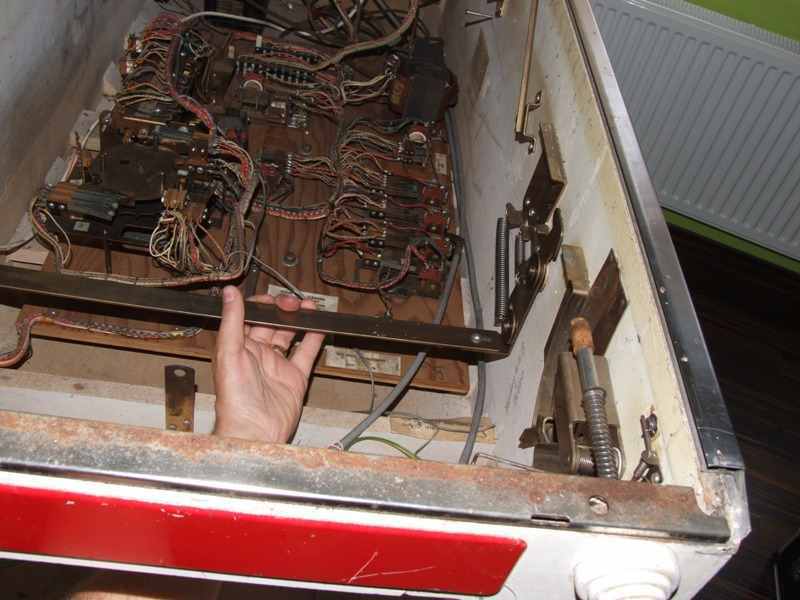 Restoration of a 1964 Gottlieb Majorettes wedgehead pinball machine. My wife and I had been thinking of getting an electromechanical one-player pinball machine for a long time. It was something we had thought of for many years already. We didn't have such an old game in our collection, we had sold our only electromechanical game (a Williams Jackpot from 1971) which we regretted. 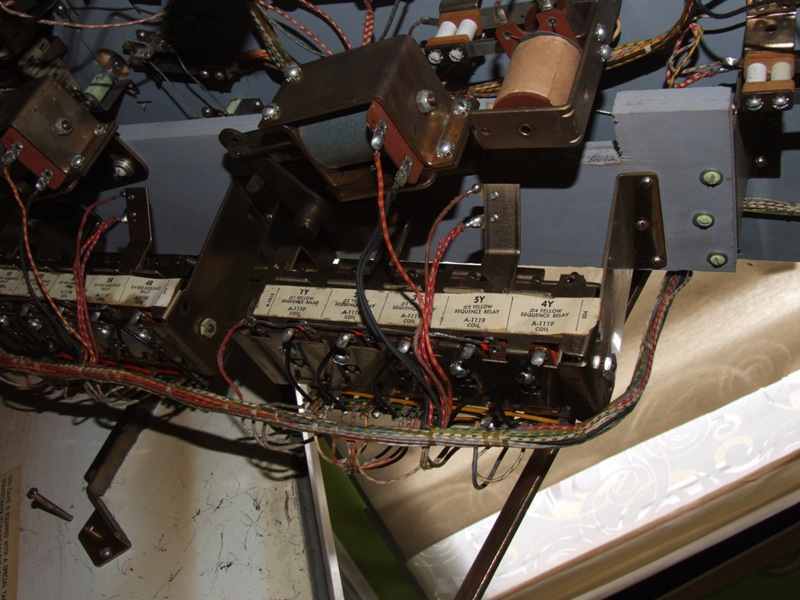 Electrmechanical pinball machines are a major part of pinball history. Even though I didn't have one all the time, it's my opinion that every pinball collector should at least have one electro-mechanical game in his lineup of games. Especially after visiting the italian pinball championship in 2009 where we played on a few of these games, we really wanted to have one. Not just an electromechanical game from the 1970ies, these you can often find cheap. But a real old one, either a woodrail or a wedgehead. But you don't see these often for sale in Europe, often they're expensive, or in non-playable condition, and sometimes you just don't know if a game is fun to play or not.. so we didn't actively search for a wedgehead or woodrail pinball machine, but both knew we wouldn't hesitate if we got the opportunity to buy one. So in 2010 it finally happened, we were able to buy a wedgehead pinball machine. Not just any wedgehead, but a 1964 Gottlieb Majorettes. Only 405 have been made and it's considered to be among the most fun games of its time. Not a bad choice :-) It has a very special layout (with an open playfield, no slingshots, ..) so from what I read you have to get used to playing this. That was exactly what we wanted, a fun game that plays completely different from newer pinball machines (where you really have to aim and control the ball that's nicely returned to the flippers), with this old game you really have to nudge the machine whilst playing to let the pinball roll where you want it to. I got the game in totally unknown condition. Even didn't know if it was complete, working, dirty, .. The game had been put away in storage, backbox folded down but still connected. I got two boxes with pinball parts with it so even didn't know if it was complete or assembled, so I was a bit nervous on my ride home. Luckily my fears went quickly away when I inspected the machine at home. It's not as bad as I thought.. Seems the game is complete and the boxes of parts are from another Majorettes (or similar game) that got parted out.. the cabinet paint is nice, I think it has been repainted (with its original scheme). 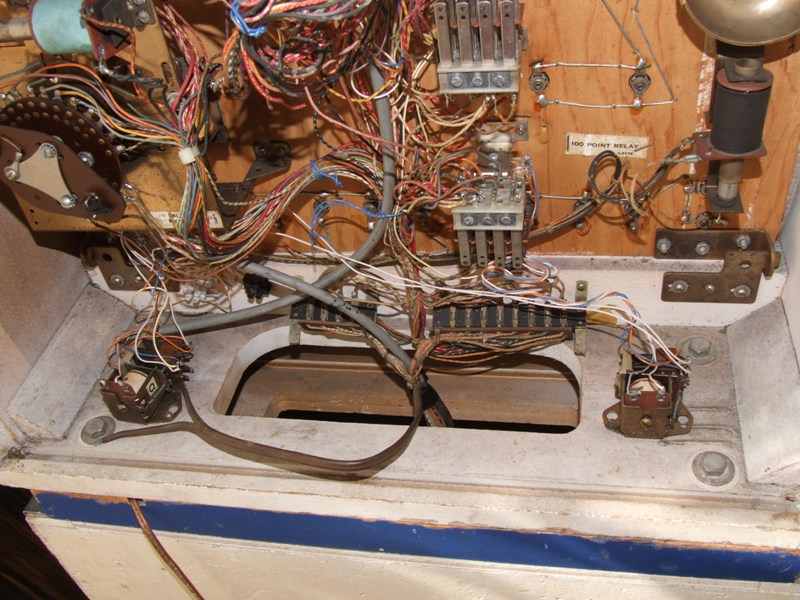 There was some strange and new wiring in the game.. Playfield glass was missing, playfield was dirty. Technically it seemed to in a good condition. No rust to be seen except some corrosion on some jones connectors - Gottlieb used a good quality of metal for their assemblies. After having a look at the machine I believe it has been revised by someone who knew (a bit ?) what they were doing, at least it should be in working condition (or was brought into this condition once), but not using all original methods.. Here is my repair log. I'll update it with more pictures as I work on this game, explain what I learn (it's the first time I work on a game this old ! ), ask for feedback, .. so if you know something that can help me then please do not hesitate to contact me. A lot of newer wires that really don't belong there. Both brown wires go into the black connector at the back (I removed the wires when I removed the backbox to load the game into my car) where they connect to 2 white wires each. 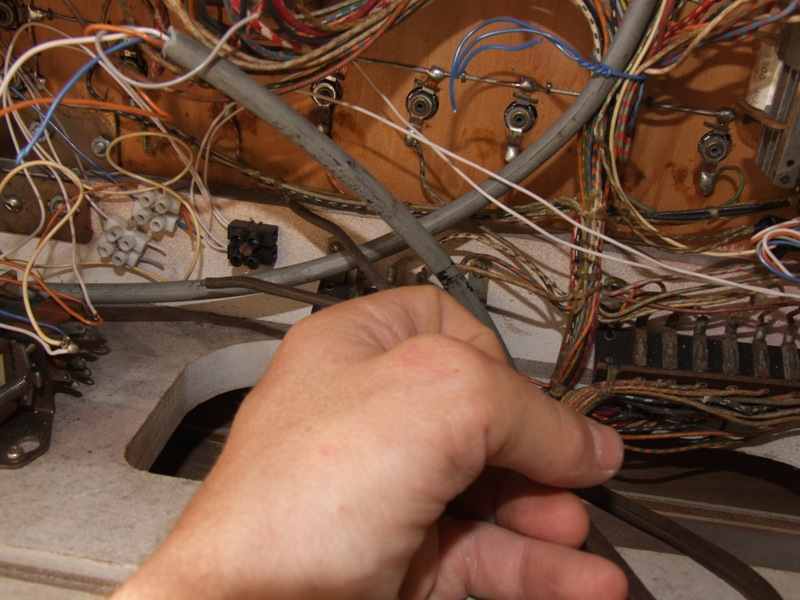 More unknown wiring. Blue, orange, grey and white wires out of this thick grey cable go to two white connectors, from where they further go to a relay at the bottom of the backbox and to other parts in the backbox. Overview of the backbox. 2 relays on each side do not belong there and their task and why they're connected like this is at the moment unknown for me.. The power wire and plug are also old, I definitely have to replace them. Just inside the cabinet the power wire is also connected onto another wire (which goes to the stepdown transformed if I'm not mistaken, but it could be it also goes towards the relay in the coindoor (see next). Don't remember exactly. So the brown wire at the bottom of the picture is now hooked up to the black plug. My biggest suprise was when I opened the coindoor. Inside this huge industrial double relay is mounted. Also noticed something which I didn't take pictures of - the switch at the bottom of the cabinet that switches on the game has another thick grey wire running to it, towards another switch (an old door bell) that's at the end of the cabinet, you can just reach for it from inside the backbox. Haven't verified this but I get the impression it's also connected to this huge relay, to turn on the power in the game ? But maybe other relays have been removed from the game and replaced by this yellow box..
At the right side in the backbox, next to the score wheels I see some empty space. A second bell unit should be there..
And at the left side of the scorewheel there's a similar stack of switches, with some new wires attached on them.. also have no idea what the switches (or new wiring) does. 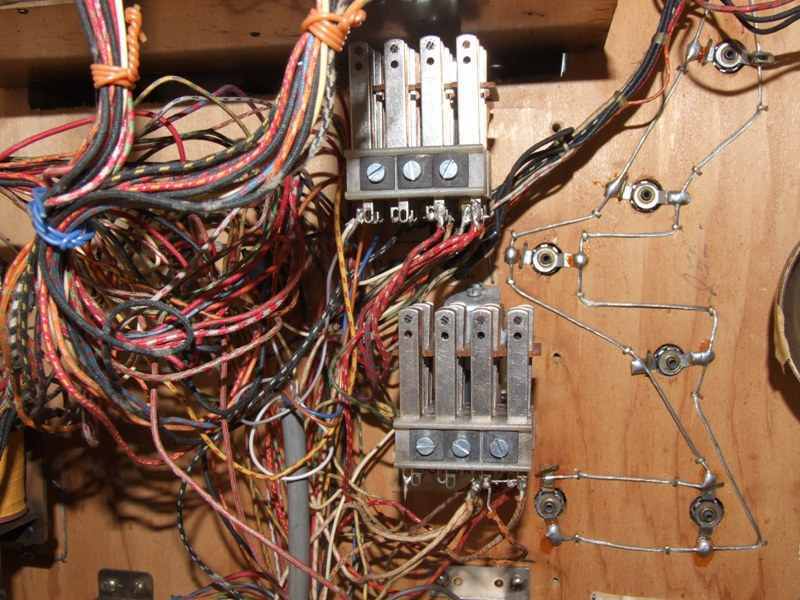 More new white wires running to switches that do not belong there at all..
Playfield picture - the game needs a good cleaning but I'm sure it'll look great when I'm finished. Cleaning the playfield will probably be the easiest task of all, as I already have a lot of experience shopping pinball machines. 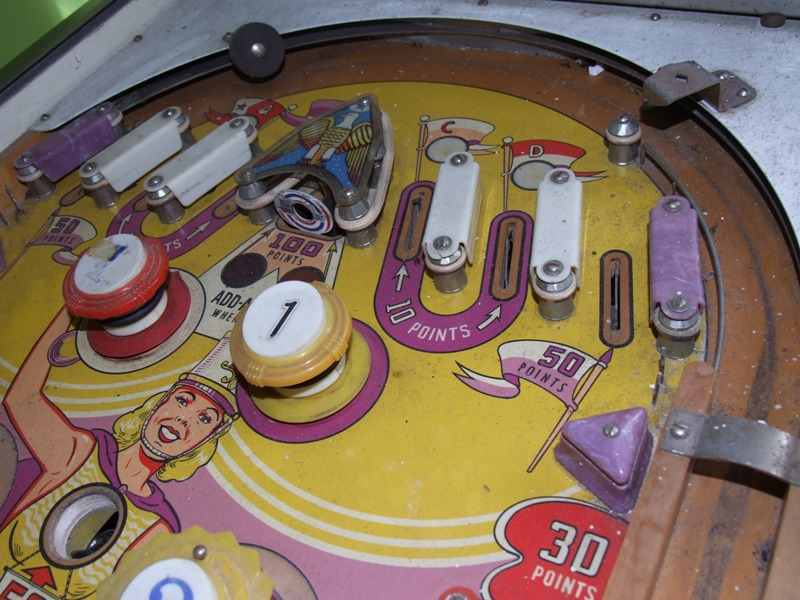 Top part of the playfield. Didn't take a picture of the backglass but that's also in good condition, only a few minor spots have paint coming loose. 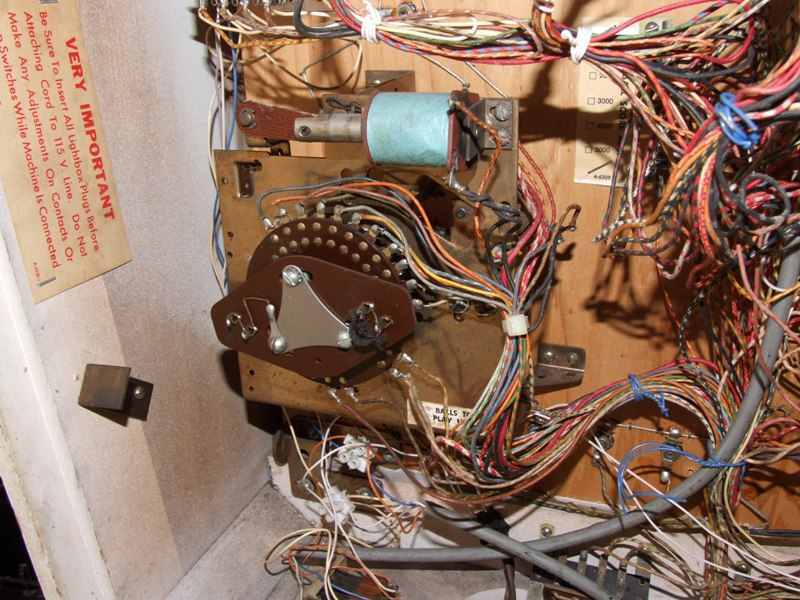 You can't just raise the playfield on this old machine, it's locked inside the cabinet. You have to pull this bar to unlock the playfield. 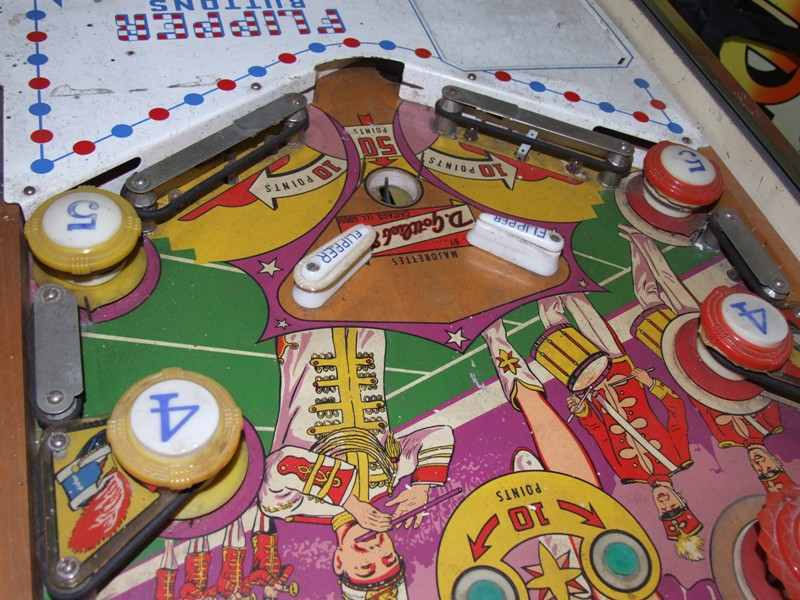 I had to look for it - didn't know it was like this, but as I couldn't raise the playfield and it didn't move at all I knew it wasn't just stuck and there had to be some trick. Took a flashlight and saw this..
Btw the coindoor and metal part above it are painted bright red. Shouldn't they be chrome originally ?? 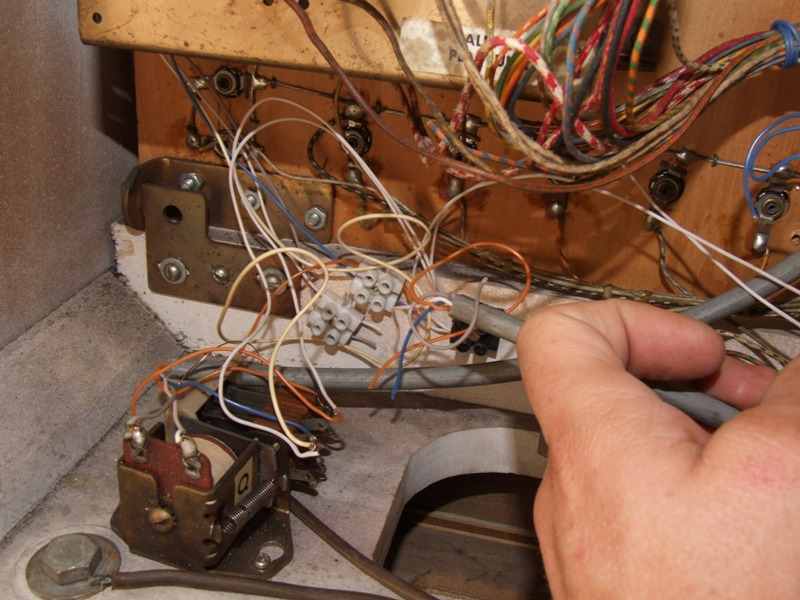 There's a microswitch at the bottom of the lever that brings a pinball onto the playfield.. that way the new wiring detects a ball brought into play ?? Btw written on the side of the cabinet is 'sunday 16-12-73 14500'. I was just 3 weeks old on that date ! I didn't see a counter (probably was removed since then, or it's hidden somewhere on the bottom of the cabinet) so have no idea how many games there have now been played on this pinball machine. 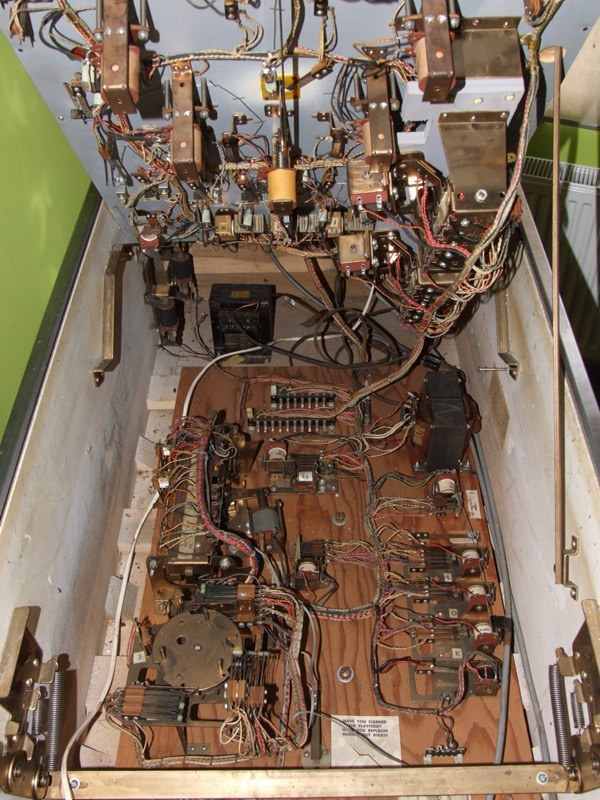 Overview of the back of the cabinet. 2 transformers, as I'm in Europe one steps down 220v to 110. 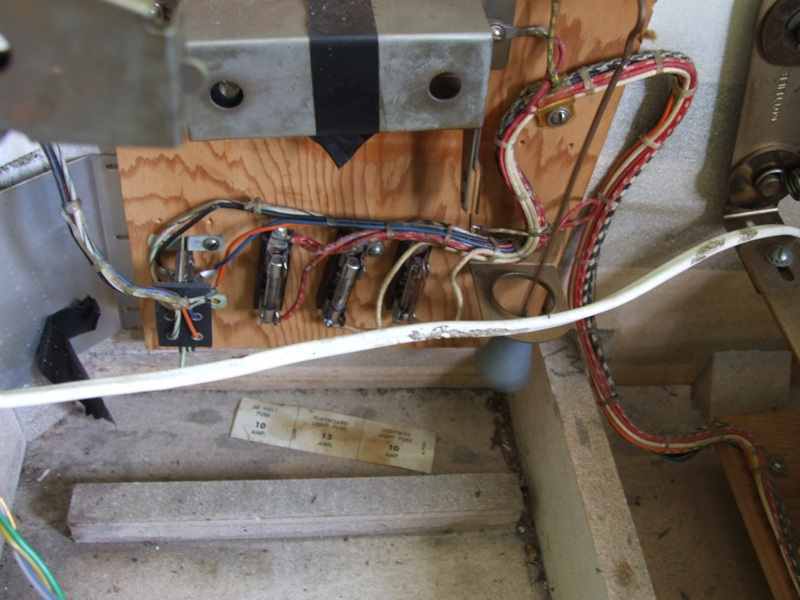 New wiring - one thick white on the left provides power to the relay inside the coindoor. Two grey wires on the right (on of which extends the bottom switch-on button to a doorbell button in the back). Another overview. Except for this hacked wiring, it all looks clean and complete.. I've seen games in much worse condition than this. 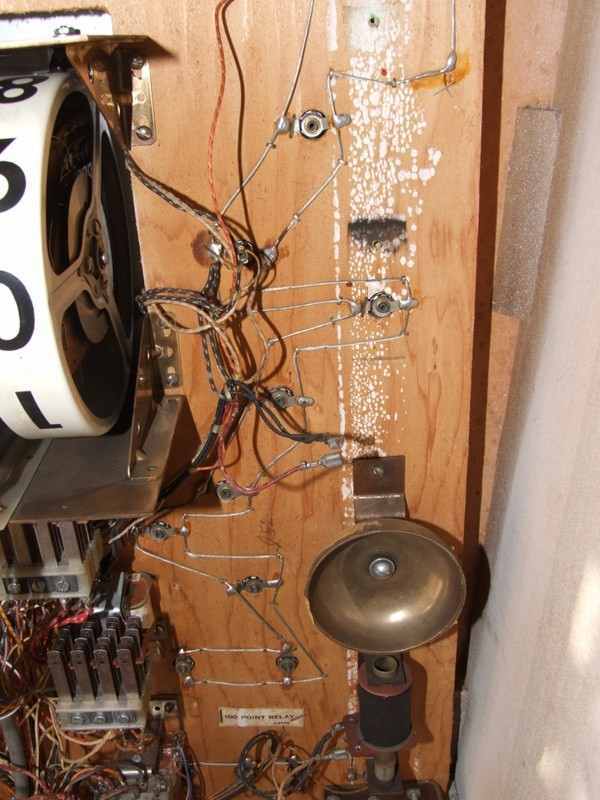 Underside of the playfield, looks all original except for one part (read further). Part of the backbox. I switched the game on to see what it does. As it looked to be complete and in good condition I wanted to risk this. Score wheels nicely reset to 0. Excellent ! That's very good already. 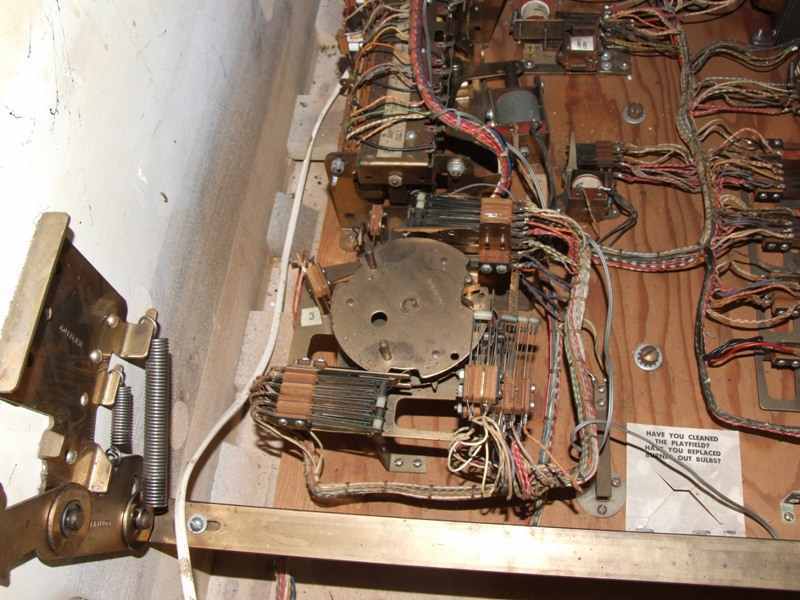 But then the motor in the bottom of the cabinet kept on running, something under the playfield kept on resetting and this also. The coil that's on the back of this unit and moves the wheel clockwise just keeps on activating, even though it's at its bottom position ?! Motor that doesn't stop running..
Large relay bank under the playfield. The right one keeps on resetting all the time. 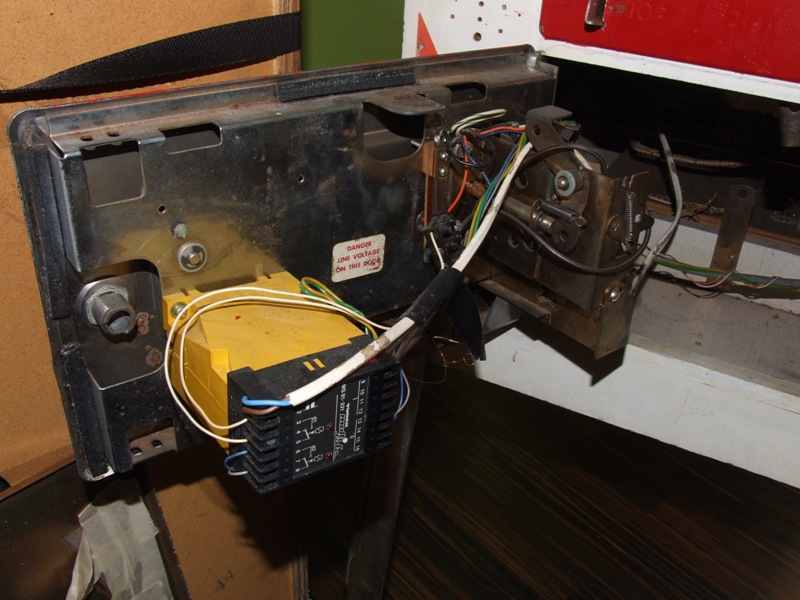 Possible a stuck switch on the playfield ? Still have to investigate.. Anyway I wanted to check if there were enough pinballs in the game (I believe there should be 5 ??). That brought me to the last missing part I discovered. It seems in the ball through there's a metal gate that's controlled by a coil. It's just missing on my game ?! The metal gate is still there but bent sideways so it cannot go into the slot to stop pinballs. The coil is completely missing. Two wires hang loose. Problem is that I don't know how much this affects the startup sequence of the game. 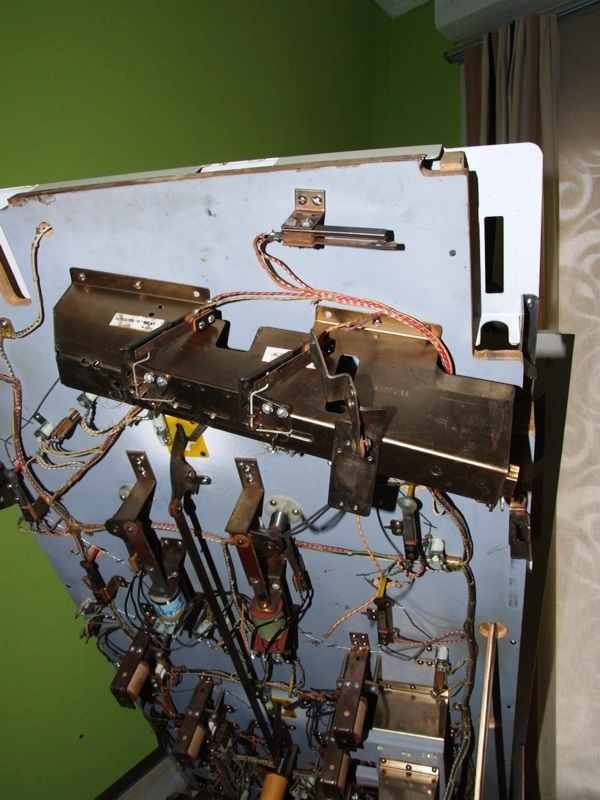 There are two leaf switches that check how many pinballs there are in the through. I'm pretty sure for the game to start that both switches have to be closed (haven't checked schematics yet) so the game knows all its five pinballs are loaded. 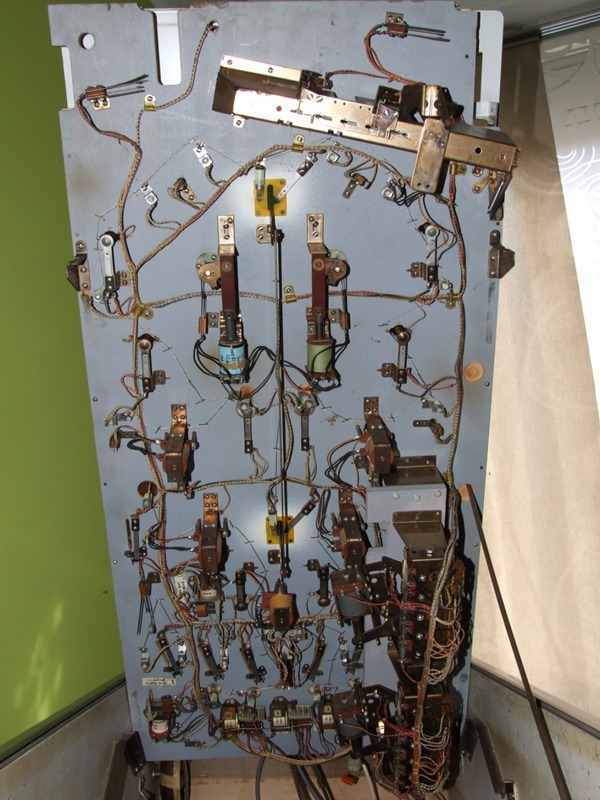 As this gate is missing, the pinballs roll further down the through and the second switch cannot be closed at all (unless I load 8 or 10 balls into the through). 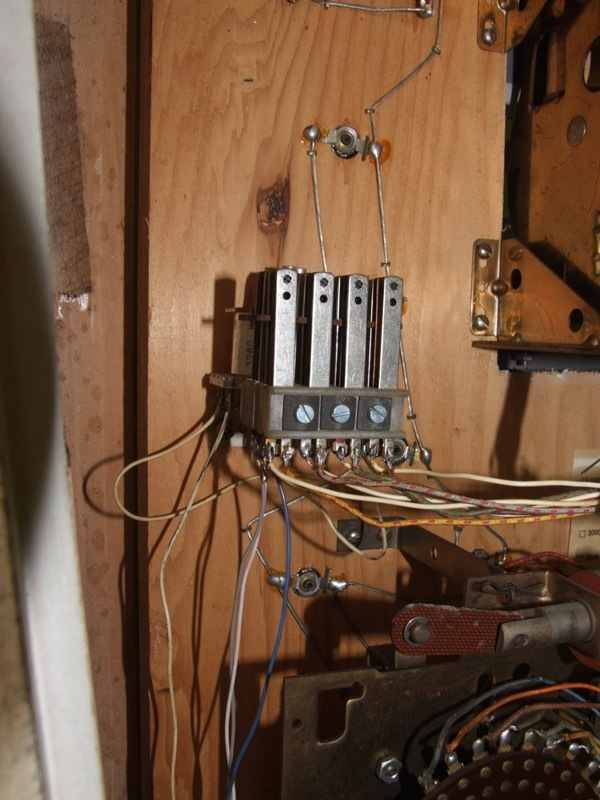 Somehow this might be related with the microswitch inside the cabinet under the lever to bring a pinball onto the playfield, that microswitch might override one of these leaf switches ? Still have to investigate..
Update: This game should only have 1 ball installed. First switch is to detect a ball, second switch is to activate the gate if the another ball can be played. 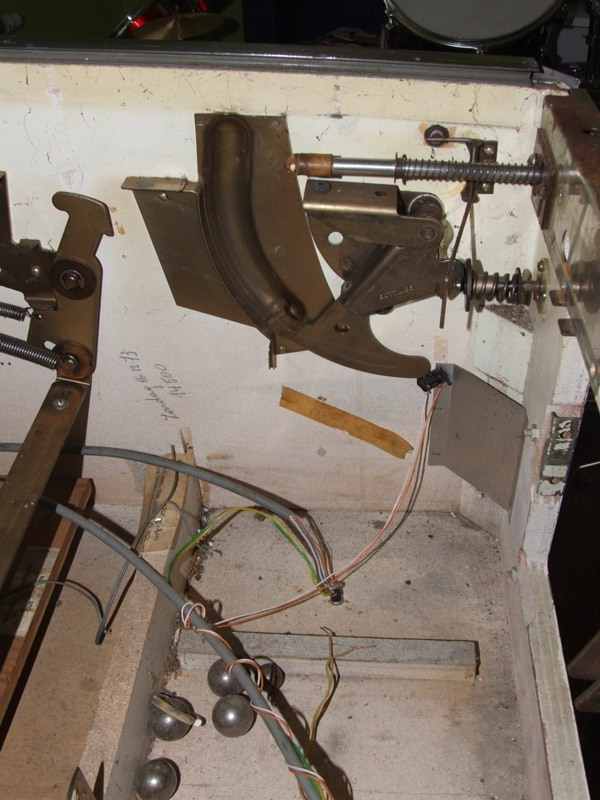 So that's all I have discovered from my first inspection of this pinball machine. I really want to get this game working and learn how these things work.. so anyone who can provide me with some information please email me at averhe@gmail.com ! Problem now is that I don't really know what to do first. 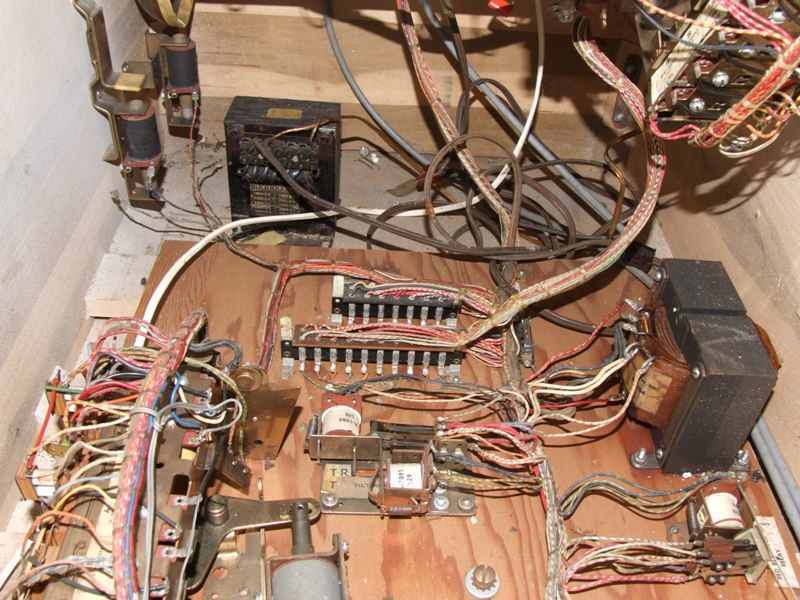 I could just start shopping and cleaning the playfield, checking and adjusting every switch, and maybe that would solve some problems (but might also introduce others). I could try to undo all these hacks but think that's the worst way to go - someone clearly had some kind of an idea what they did when they added it and probably got the game running with it all installed - whilst I currently have no idea at all how this game should operate. So probably I'll first try to get the game running, try to understand how the game should originally work and what the hacks do, later clean the playfield, and only then try to bring it back in original state and undo some of the hacks..
Part 2 of this restoration: cleaning the playfield.